Thirty-five drugs are presently available in multiple global markets for Parkinson’s disease (PD) patients. But, a cure for this disease is yet to be discovered. Patients depend on symptom ameliorating drugs, rather than drugs that actually modify the course of the disease. Furthermore, the majority of drugs do not address the psychological symptoms associated with PD such as dementia and psychosis. Parkinson’s disease has a large unmet medical need and, therefore, development of new drugs is vital for patients. 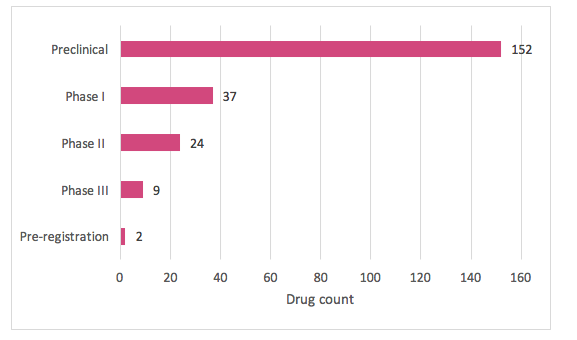 Currently, 224 drugs are in active development for PD. The majority of drugs are in early development, with 68% of all drugs being in preclinical stages. The 11 drugs in late stage development (Phase III and pre-registration) have one thing in common with each other, and current drugs on the market – they all act upon the dopaminergic system in the brain. It is widely acknowledged that the degeneration of dopaminergic neurons, located in the substantia nigra of the midbrain, is involved in the pathogenesis of Parkinson’s disease. Reduced dopaminergic signalling results in the classic motor symptoms such as tremors, rigidity, bradykinesia etc. The majority of drugs developed, and available on the market for PD patients, target the dopaminergic system directly or indirectly to sustain signalling and reverse these motor effects .However, these are not going to stop the further degeneration of dopaminergic neurons, and after a few years, patients become resistant to the dopamine therapies, which become no longer effective . After reviewing the mechanisms of action (MOA) of drugs in development for PD (Table 1), it is evident that drugs targeting dopaminergic neurotransmission remain the most popular choice by industry. However, there are emerging therapies in Preclinical and early clinical development which show promise as they intend to target the root cause of disease rather than just the symptoms. Two particularly interesting mechanisms currently being investigated include alpha synuclein inhibitors and glial cell line derived neurotrophic growth factor (GDNF) agonists. Currently, around 10% of the drugs in development for PD are alpha synuclein inhibitors (21 of 224), with the majority in preclinical development. Following behind this, GDNF agonists are the next novel mechanism being investigated, with 5 of 224 candidates. There is mounting evidence pointing towards the involvement of alpha synuclein aggregation in the pathogenesis of PD. Alpha synuclein was the first ‘Parkinson’s gene’ to be identified back in 1995, and aggregation of this protein, due to a gene mutation, is hypothesised to be the cause of dopaminergic neuron degeneration in PD . Alpha synuclein inhibitors are, therefore, promising PD therapies with potential to prevent neurodegeneration and the downstream symptoms. 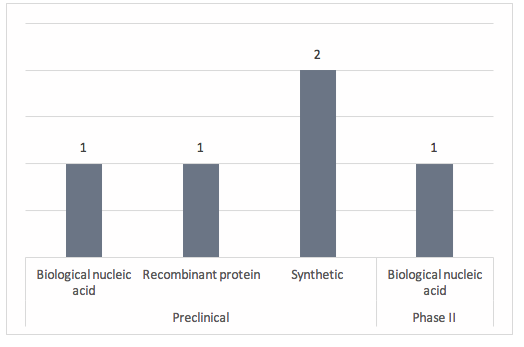 A breakdown of origins of these drugs, by development stage (Figure 2), reveals that most are at the Preclinical stage, and more have biological (12) origins than synthetic (9). Both biological and synthetic alpha synuclein inhibitors are being investigated for PD. The majority of biological drugs are antibodies (four of twelve). The single drug currently at Phase II is Prothena’s anti-alpha synuclein antibody, PRX002. Notably, Phase I PRX002 trials demonstrated its tolerability, safety, and an ability to penetrate the blood-brain barrier. Furthermore, a significant reduction in free serum alpha synuclein was demonstrated also in these trials. The Phase II trial, initiated recently in June, investigates PRX002 efficacy in PD patients, and is expected to be completed in 2020. Another anti-alpha synuclein antibody, Biogen’s BIIB054, is at Phase I. Its single trial is currently ongoing in the USA, and enrols both healthy patients and subjects with early PD, and investigates safety, tolerability and cognitive outcomes. The trial is expected to be completed in September 2017. The other drugs in Phase I are synthetic compounds. Two of them are Affiris’ alpha synuclein vaccines, PD-01 and PD-03, which were developed using their proprietary ‘AFFITOME’ technology. These vaccines aim to prevent alpha synuclein aggregation in early stage PD patients by mimicking this molecule and promoting antibody response against it. Phase I trials of PD-01 and PD-03 have recently demonstrated positive results in PD patients. The trials showed that the vaccines were safe and well tolerated by patients. PD-01 leads to a long-term immune response which is boostable. The third drug is UCB-1332, a small molecule being developed by Neuropore in collaboration with UCB. A Phase I trial in 55 healthy subjects was successfully completed in 2016 and UCB is currently planning a Phase Ib trial to test the drug in PD patients in Europe. The other disease modifying MOA, GDNF agonists, currently has five drugs in PD development. As a survival factor for dopaminergic neurons, GDNF could, theoretically, improve survival and regeneration of dopaminergic neurons, counteracting the neurodegeneration caused with PD. One biological GDNF agonist has reached Phase I/IIa status. UniQure is developing a GDNF gene therapy, AMT-140, which delivers this survival factor via adeno-associated viral vector to increase levels of it within the brain of PD patients. Phase I trials demonstrated its safety and tolerability, and the Phase I/IIa trial aims to demonstrate efficacy, with results expected in 2017. Another biological recombinant protein GDNF agonist, BVF-014, also reached Phase II. Phase I trials had shown this drug had positive results, suggesting a direct effect on dopaminergic neurotransmission and demonstrating an improvement in the function of PD patients. However, in Phase II trials, which were completed by Medgenesis in 2016, the drug failed to meet primary endpoints of improving the UPDRS motor score in PD patients after 9 months of treatment. This lack of efficacy was thought to be due to poor delivery of the drug to the putamen, rather than a failure of the mechanism of the drug itself. Considering the available evidence from Preclinical and Phase I trials, it is believed that this drug could offer potential as a novel disease-modifying treatment for PD patients if a more accurate and precise delivery technology were used. In addition to the drugs featured in Table 1, there are currently 11 cellular therapies in development, which also aim to modify disease pathogenesis by promoting regeneration of neurons. 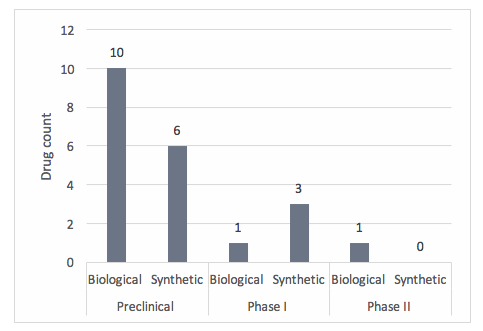 Most of these therapies are in Preclinical development, apart from Cyto Therapeutics’ Phase I status neural stem cell therapy, and Living Cell Technologies’ (LCT) Phase II status NeurotrophinCell (NtCell). Cyto Therapeutics’ subsidiary, International Stem Cell corporation (ISCO), employs a proprietary technology to create parthenogenetic stem cells from unfertilized human oocytes. These cells are pluripotent and non-immunogenic, like human embryonic stem cells, and can be induced to develop into neuronal cells. Their use might be advantageous compared to embryonic stem cells, as they avoid ethical issues, and the cells derived from a single donor can be made to immunologically match to millions of individuals. In preclinical studies in rodent and non-human primate animal models of PD, this cellular therapy has shown tolerability and efficacy in improving disease symptoms. This therapy is currently in a Phase I/IIa trial in 12 patients with moderate to severe PD in Australia. As of April 2017, four patients have undergone surgery, in which these neural cells were implanted into their brain. No adverse events have been reported in any of these patients, thus far. LCT’s NtCell is a therapy derived from porcine choroid plexus cells, which are implanted into the putamen of PD patients. These are encapsulated in seaweed-derived gel to protect them from the patient’s immune system. The cells release growth factors, anti-oxidants, and neurotrophins, to protect the health of neurons and promote their growth. Results from the Phase I/IIa trial in 4 patients showed that implantation of these cells improved the symptoms of PD and promoted remission of disease. Parkinson’s disease is notorious not only for motor defects because many patients also suffer with non-motor symptoms, including psychosis and dementia. Worldwide, over 10 million people suffer with PD  and it is estimated that over 50% of patients will have experienced psychosis symptoms at some point in their life . Despite this, only 1% of all drugs in development for PD are focussed on the treatment of psychosis symptoms. Psychotic symptoms include hallucinations and delusions and have a huge impact on the livelihood of the patient. Traditional antipsychotics that target the dopaminergic system exacerbate the motor symptoms of PD and counteract dopaminergic therapies. In April 2016, Acadia’s Nuplazid (primavanserin), a non-dopaminergic antipsychotic, became the first ever drug to be approved for PD psychosis, fulfilling a major unmet need for this non-motor PD symptom. Currently, three additional drugs are in development for PD psychosis, specifically, one in Phase I and two in Phase II. Overall, much of PD drug development remains focussed on correcting dopaminergic neurotransmission to reduce the motor symptoms. However, it is evident that novel mechanisms are being investigated, to both modify the disease pathogenesis and address the other debilitating mental symptoms associated with PD. Although the majority of therapies discussed here are in the early stages of development, and may not prove successful in the long term, the focus on disease-modifying therapies are steps in the right direction towards finding a true cure for PD. In addition, the success achieved in 2016, with approval of the first ever psychosis treatment tailored for PD, alongside ongoing clinical development in this therapeutic arena, illustrates how an underserved population can be hopeful for efficacious treatments. Considering the novel approaches in PD drug development highlighted within this report, it can be concluded that potentially life changing treatments may be on the horizon for PD patients. Rascol et al (2003) Limitations of current Parkinson’s disease therapy. Ann Neurol, 53 (Suppl 3),S3-12; discussion S12-5. Olanow, C.W. and Brundin, P. (2013) Parkinson's disease and alpha synuclein: is Parkinson's disease a prion-like disorder? Mov disord, 28(1), 31-40. Parkinson’s Disease Foundation (2017). Statistics on Parkinson’s. Available from:http://www.pdf.org/parkinson_statistics [Accessed 21 July 2017]. Fenelon & Alves (2010). Epidemiology of psychosis in Parkinson’s disease. Journal of the Neurological Sciences. 289, 12-17. Available from: http://www.sciencedirect.com/science/article/pii/S0022510X09007679 [Accessed 20 April 2017].